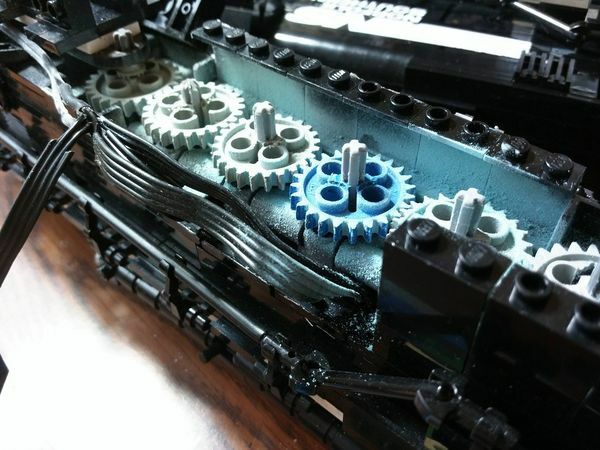 ABS Dust is the term given to the powder that builds up when two LEGO elements rub against each other continually over long periods of time. Typically axles, pins, and gears; but can also occur with liftarms and beams if they're used for guide rails. ABS dust can be reduced with proper bracing (minimising the movement of the parts to only that which is necessary for the mechanism to function), reducing the load on the affected parts, or the use of lubrication. This is a particularly bad case of ABS dust. This page was last edited on 2 September 2015, at 21:36.